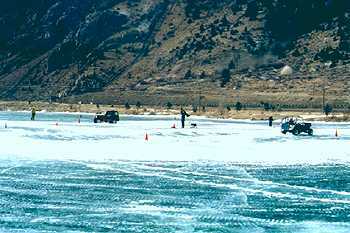 On the 14th of January 2001 myself-Steve Gilbert (TJ) and Don Deralth (XJ), took a Sunday trip to Georgetown for the 25th annual Georgetown Ice Races. 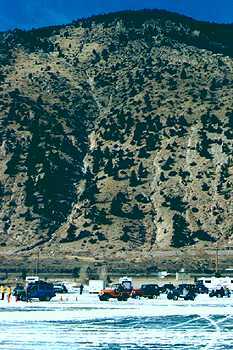 Georgetown is located a couple miles past Downeville right off of I70 west. 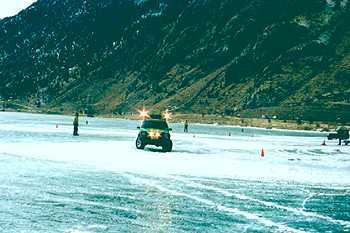 "Our Gang Four Wheelers Inc" puts on the ice races that last all weekend long. Saturday the 13th was reserved for "Studs and Cheaters" while Sunday is the day for the light core and novice racers in the bare rubber class. We arrived promptly at 9am for registration and the required tech inspection. It seems that some people try to race with unanchored batteries and they occasionally hit the fan…then something else hits the fan if you know what I mean!! The tech man also checks tires for size, p.s.i. and any sipeage. If you have sipped tires you must race in the pro-stock class due to the "unfair" advantage you have…sorry Don. Line for the pro-stock class…those guys were tough to beat…hey isn't that Don in the XJ?? After registering and the five-minute tech check we had a little time before the first race started. 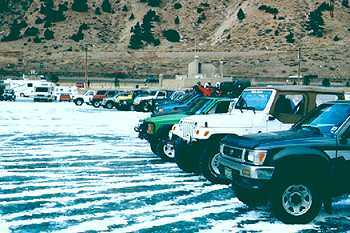 As the different trucks lined up for the much-anticipated practice run we all noticed that there were some trail ready jeeps and then there were some not-so-trail-ready trucks and SUVs. 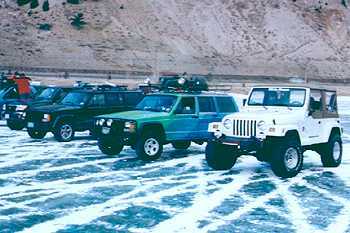 Being fairly new to racing my jeep on a lake I'm sure that I wasn't the only curious one to know which rig would do better… the locked up rock crawler, or the stock explorer sport trac for example. Figuring that front and rear lockers would aid in maneuvering during the slid turns, I thought that we had the unfair advantage. The practice run wasn't so bad we all seemed to get the feel for the course and where to put our jeeps prior to every turn. Don and I …"pre-race prep." The first race was the women's bare rubber class. I wasn't surprised to see the women put up such a fight. Some with male copilots and some without copilots at all they weaved in and out of the turns pretty well…for girls hahaha…just kidding ladies. The next race was the men's bare rubber class which most of us were in. My passenger raced my jeep as well since we registered as two separate racers. These races are single elimination, if you lose once you're out for the day so the pressure was on. Race after race, the competition was pretty even, the winner not finishing all that much faster than his competitor. I was in the 19th race and was competing against a Nissan Pathfinder. 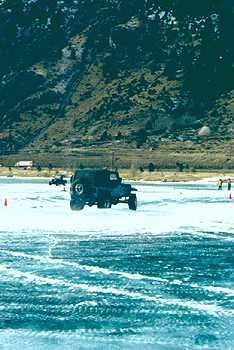 I had stepped out of my jeep to meet the driver I was racing against (and going to beat!!) and found out he had raced here before…uh oh. Well we soon lined up at our respected ends and the light flashed green…we were off. I tell you it's a bit different racing under pressure. I was all over the place, mimicking about the same amount of grace as a car wreck in slow motion, but hey I was having fun!! One of us had the chance to race in the pro stock class (due to sipped tires) and he did rather well given what he was up against. There weren't any mechanical catastrophes or flying batteries (thank god!) but some racers had issues with a tire or two. Some guys rolled the bead so bad the tire came off the rim all together, others hit the ruts just right and knocked the tire off the bead, and I believe one guy even punctured a tire due to violent and frantic steering. It's sort of amusing to watch five grown men try to change a tire on ice. One jacks the truck up, while the other slips and slides to get the tire out from under the truck, then the other two all push on the guy that's unbolting the over tightened nuts. 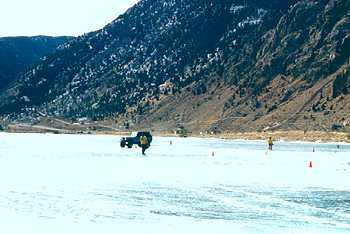 Seems he just can't get the traction to do it himself on the ice. Oh.......and throughout the whole day I don't think I saw one person fall on their tailbone…that's a good thing. 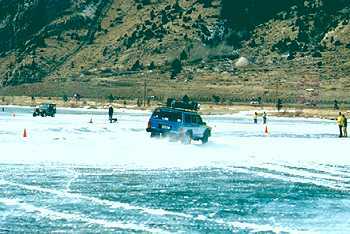 All in all, it was a fun day of jeeping and racing in the 25th Annual Georgetown Ice races! !